Every year, I impose a rule against planting anything other than succulents during the summer months. And pretty much, every year I break it. I'd already reinterpreted my own rule to include an exclusion for bromeliads as well as succulents but late last week, on a trip to my local garden center, I just ignored it entirely. I went to the garden center to pick up additional mulch but I came home with more than just mulch. However, I'd like to note that one of the plants I brought home is a succulent. 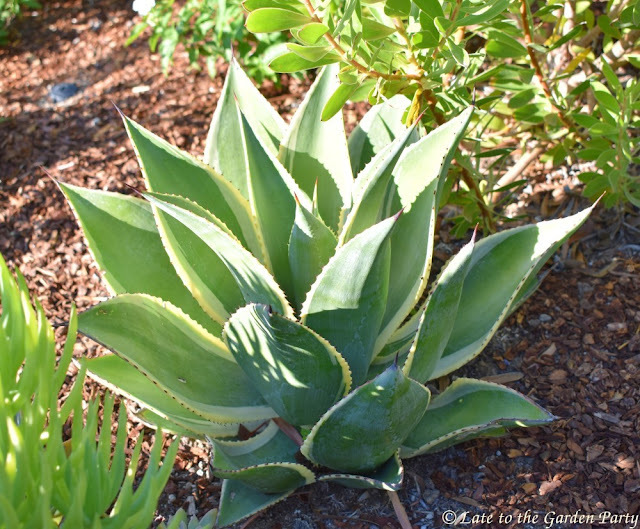 This is Aloe labworana, a stemless aloe that grows just 1-2 feet tall bearing yellow flowers in the fall. 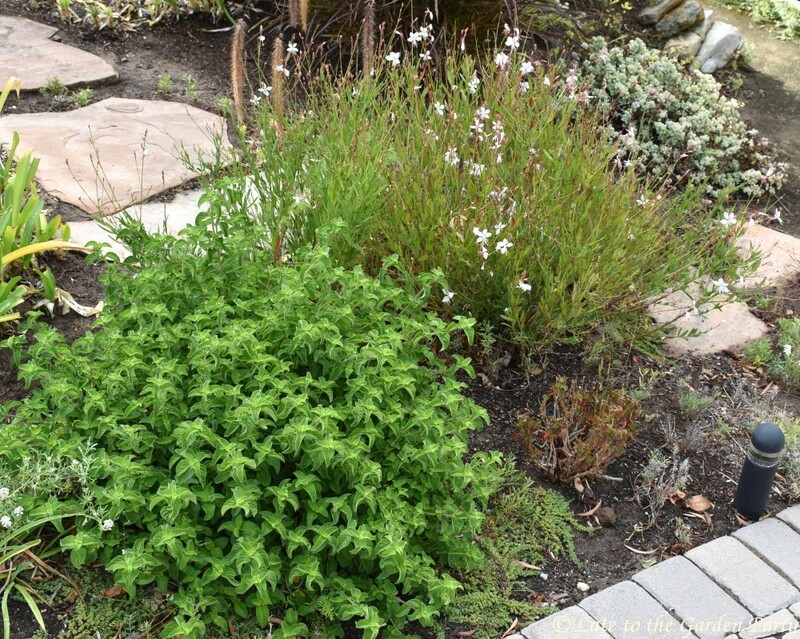 I've planted it on the west facing slope in the front garden. I also brought home three Gomphrena. Now this particular Gomphrena is an annual. When I think about it, my rule should have had a special proviso addressing annuals. They're not expected to last more than a season so, as long as the annual in question is heat tolerant, I should've had a summer-planting exception for that. Gomphrena 'Pinball Snowtip Lavender' is heat and drought tolerant. I planted it in the bed fronting our garage. But my third purchase can't be justified as easily. In my defense, I've been looking for reasonably priced specimens of the plant in question for a year now. Last year, it was new to the local garden centers and pricey. I bought one and have looked for more ever since. They haven't been widely available here and, when I've found them, the price has made me choke. So, when I found one-gallon containers for what I considered a very reasonable price, I had to bring home three. This is Lomandra 'Platinum Beauty'. 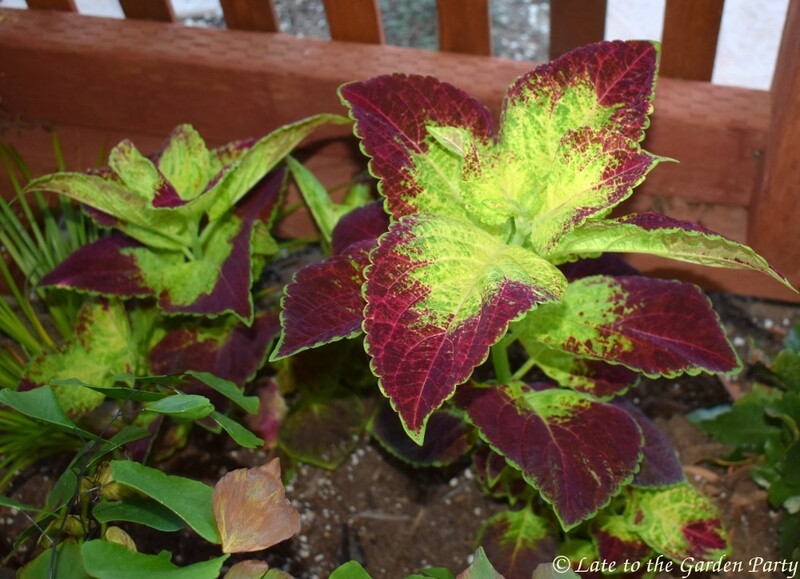 The one I bought last year has done well in partial shade with very little water. They'll get a little more sun here but the soil should also hold moisture better. Oh well. Rules are made to be broken, aren't they? I usually wait until September to blatantly ignore my self-imposed rule but I got an early start this year. 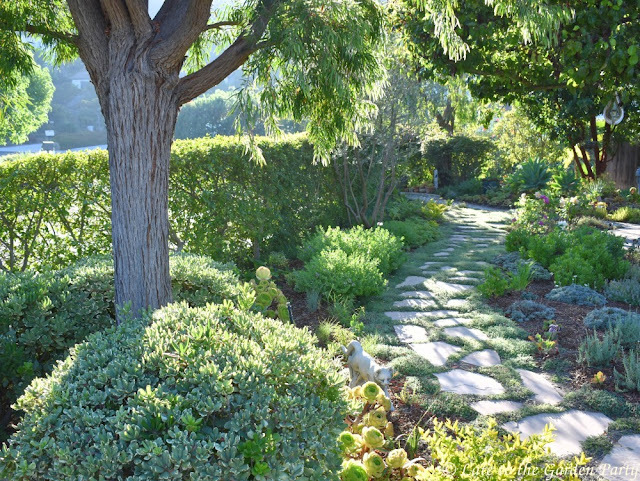 Between winter's pitiful rainfall and July's nuclear heat blast, it's been a tough year for the garden and it's hard not to want to step in to "fix" it. There are 3 Erigeron glaucus 'Wayne Roderick' in front. 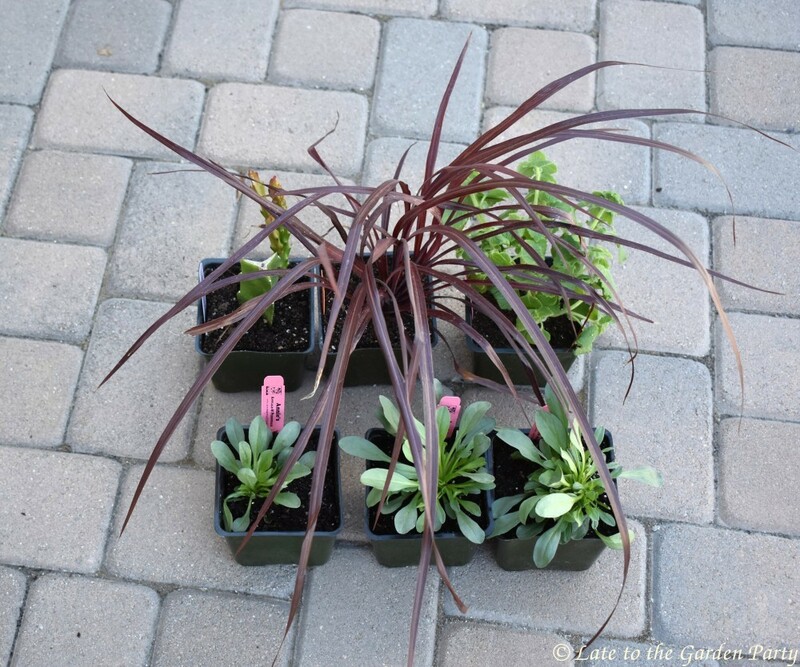 In the back row, left to right are: Epiphyllum 'Monastery Garden', Cordyline 'Design-a-Line Burgundy', and Plectranthus lanuginosa. I've got spots identified for all of them. 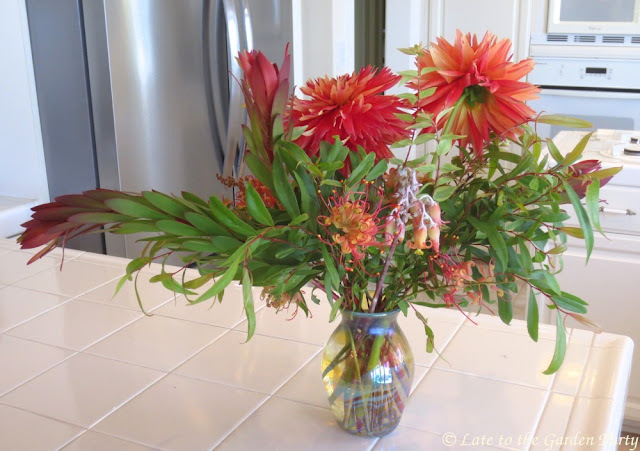 The Erigeron and Epiphyllum were already on my fall planting list. 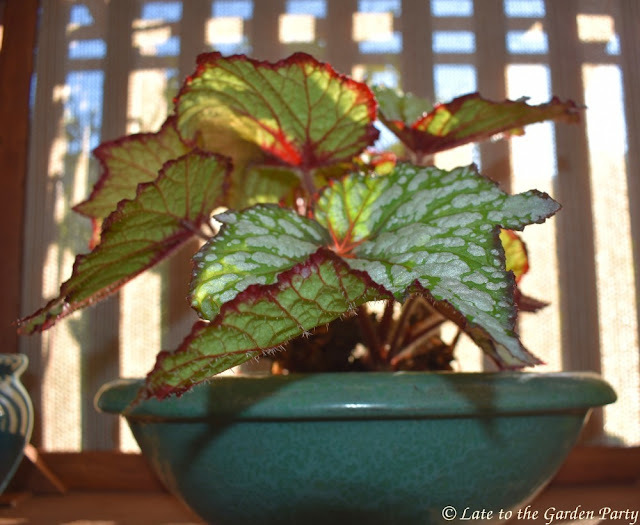 The other 2 plants were spur-of-the-moment selections to round out the order. 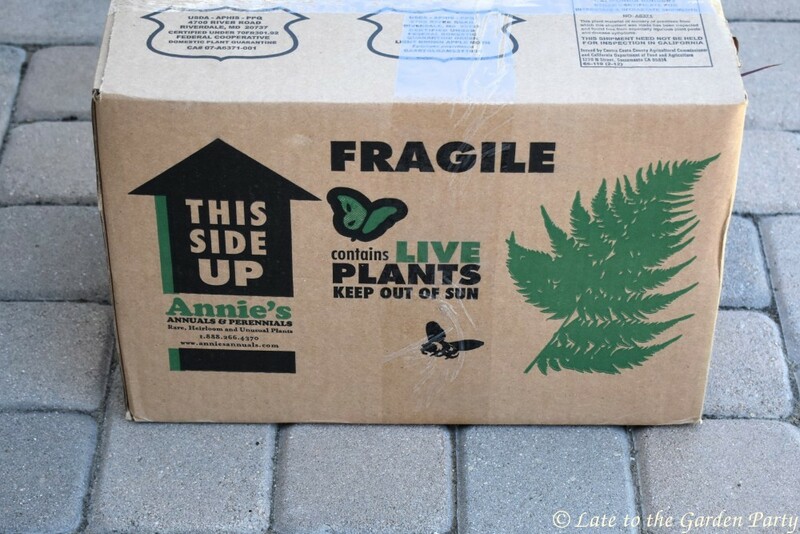 I'll be doing planting my new arrivals this weekend as well as potting up some rampant seedlings, which is a fine way to spend my time. However you spend the extended holiday weekend, I hope you enjoy it! 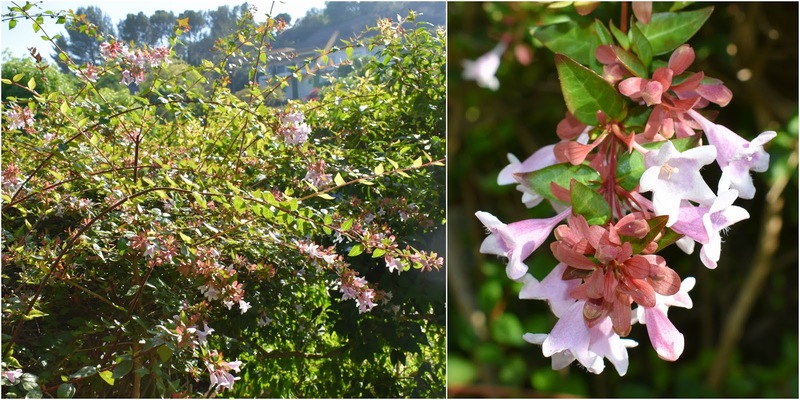 In October 2014, I picked up a one-gallon pot of Barleria obtusa at my local botanic garden's fall plant sale. In 2015, it had reached a modest size and flowered nicely. In 2016, it looked even better but in 2017 I began to have some concerns that it might be a trifle too exuberant. 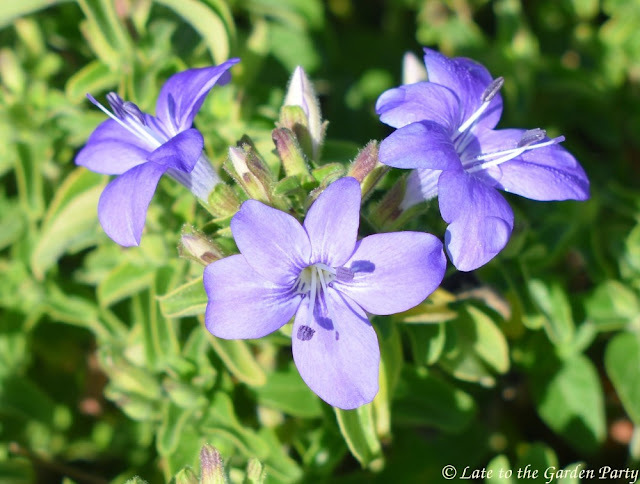 However, I adore plants with blue flowers and the Barleria blooms profusely so I was willing to forgive a lot. 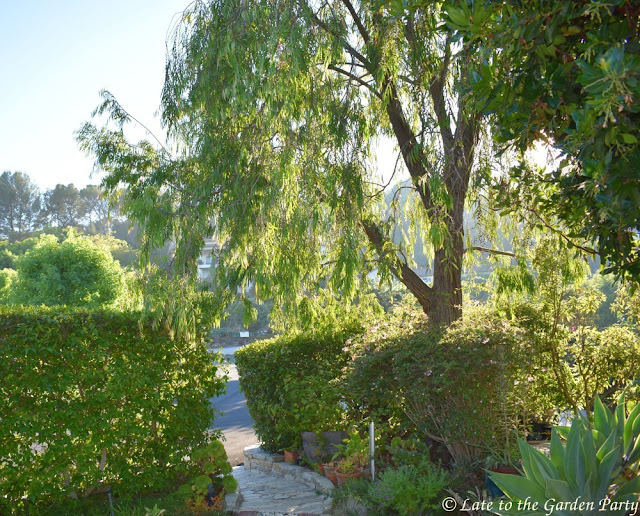 At the end of its bloom period last November, I cut my largest plants back hard, even as I transferred some of their seedlings to new areas. 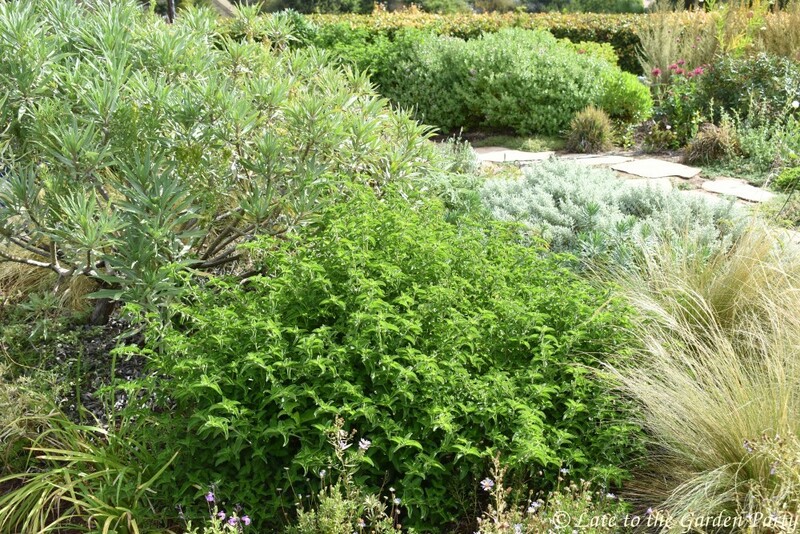 Despite being cut to a height of 6 inches or less, the original plants have already exceeded their mature size last year. Plants that were mere seedlings last year have also assumed a respectable size. And I continue to find seedlings all over my garden. 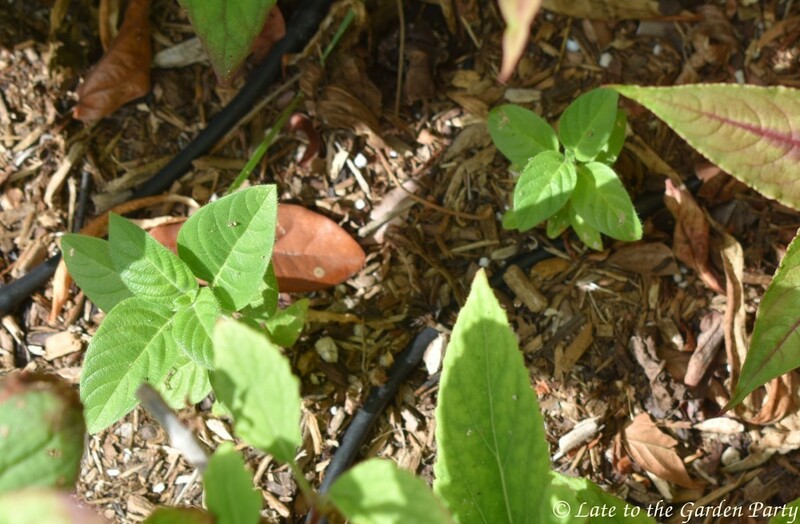 Every time I cut something back or clean up and area, I find more Barleria seedlings. I've considered transplanting some of these on my ugly, neglected back slope to see if they can survive even there. 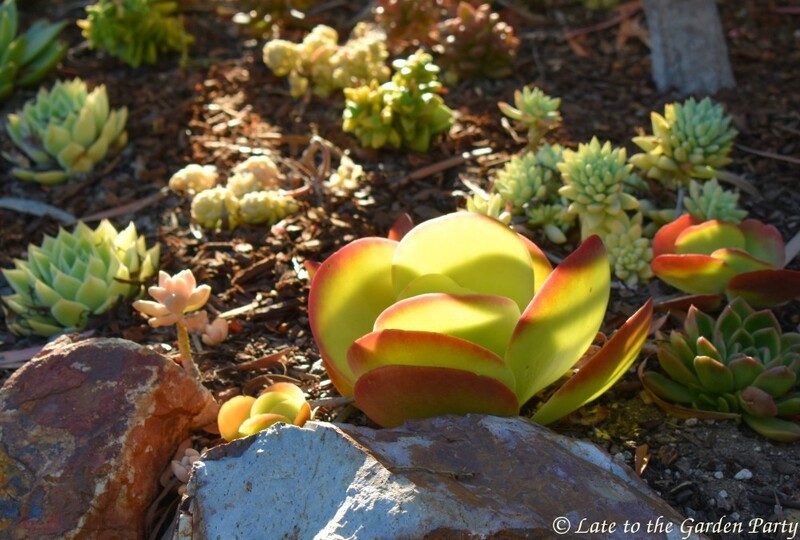 They have a reputation for being very drought tolerant. But when I saw this I began to wonder if perhaps I've made this plant too welcome in my garden. 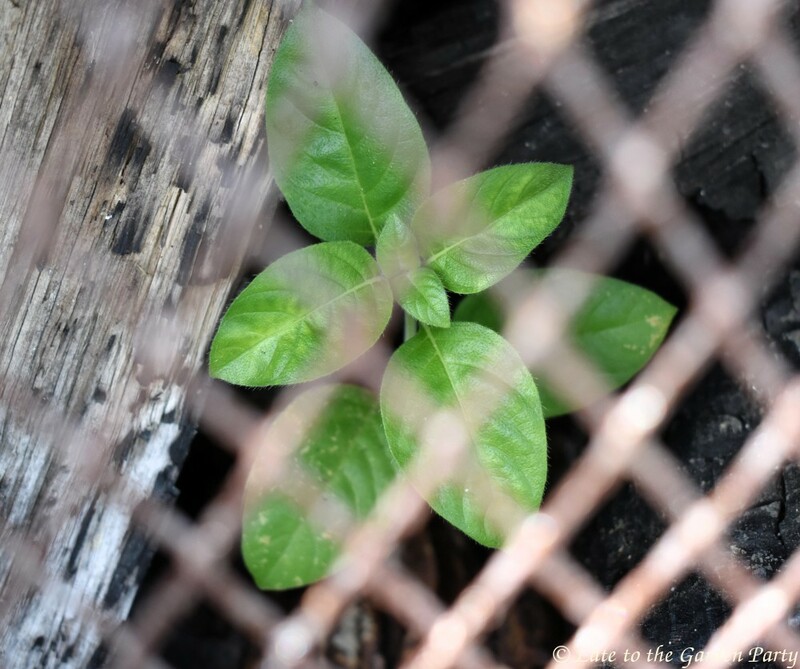 If it looks like this plant's in a cage, that's because it is. But I didn't put it there. Pulling back a bit, here's a better view of where I found this seedling. This chimenea was left behind by the prior homeowner. 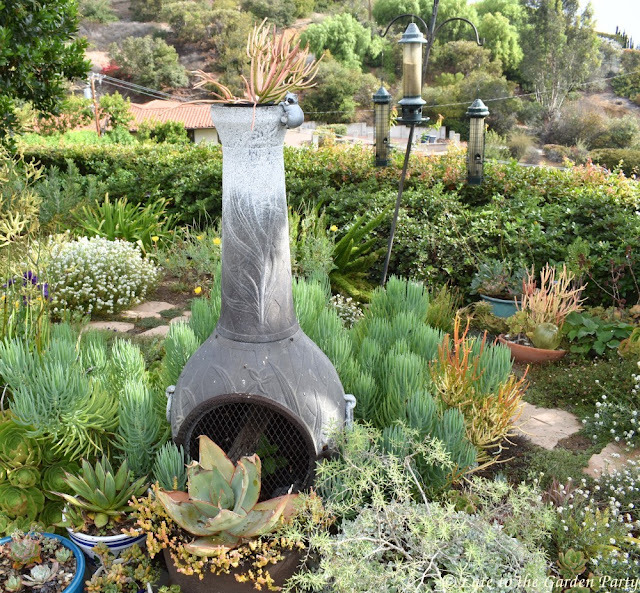 I had an Aloe striata in a pot sitting in front of the chimenea's grill and, while inspecting the battered aloe last week, I noticed a splash of green color in the background. 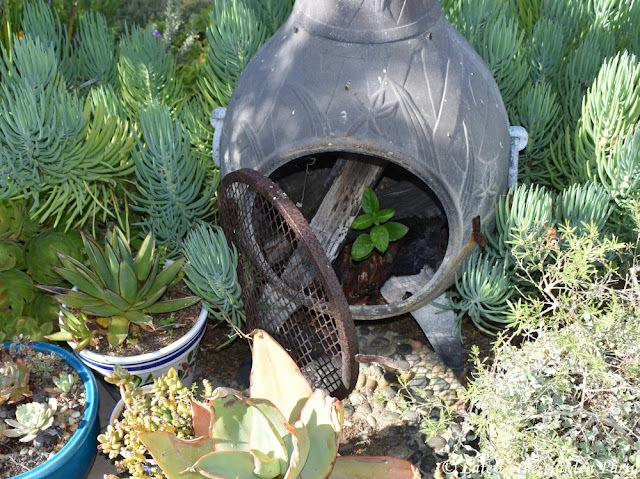 At one time I had a vague plan to use the chimenea as a plant container but that task never rose to the top of my project list. I haven't decided what to do with either the chimenea or the plentiful supply of Barleria seedlings I have on hand but I feel as though a pushy Mother Nature is nudging me along. This is my Wednesday Vignette. For others, visit Anna at Flutter & Hum. 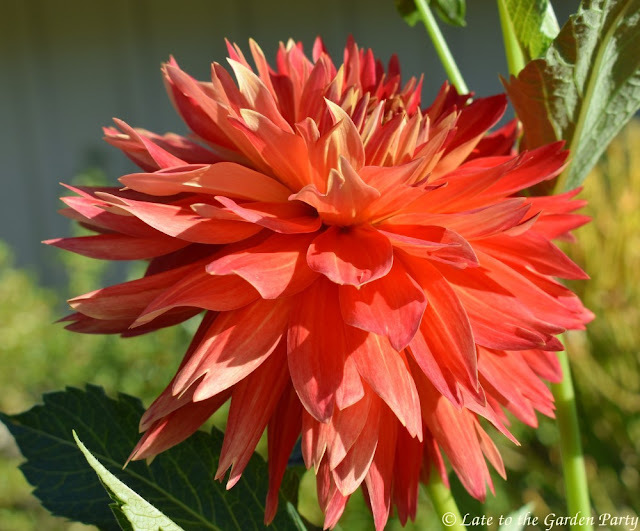 With dahlia buds opening on a daily basis, those flowers currently demand to be cut. As it is, I don't get around to cutting some of the flowers before they fade, even when I refresh the dahlias in my vases mid-week. Not that I'm complaining! Dahlia 'Loverboy' has sat on the sidelines for a couple of weeks now so it was time to bring him back on the public stage. Blue Eustoma has been hanging out in her bed so long she's looking ragged so there was no serious thought to having her join him this time. 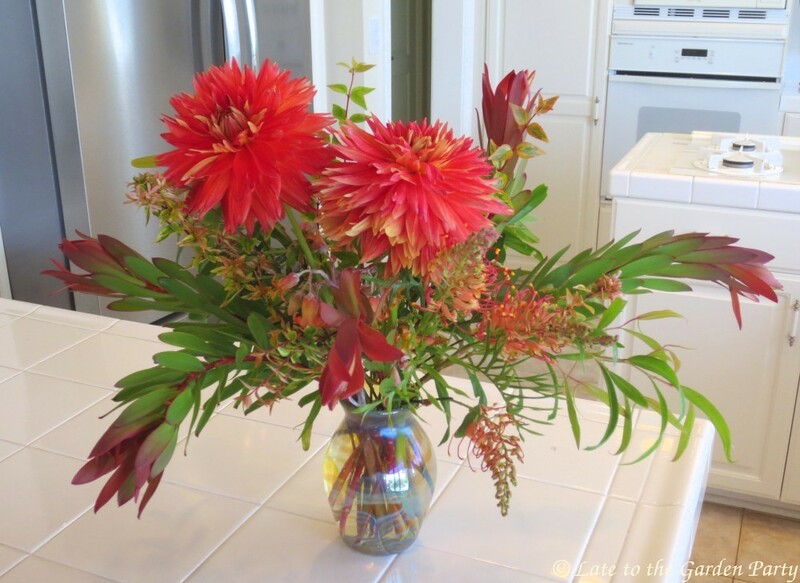 Fortunately, some new blooms were available to perform roles as companions. As for Amaryllis belladonna (who frequently goes by the names "Surprise Lily" and "Naked Lady"), she could care less whether 'Loverboy' accompanies her. She believes she can hold the stage all by herself. While 'Loverboy' is keeping a lower profile this year, 'Punkin Spice' is living large. His companions are more diverse and exotic than those 'Loverboy' hangs with. With his flamboyant personality, it's hard to conceive of him keeping steady company with anyone, though. 'Punkin Spice's' cast list filled up quickly so the zinnias joined a smaller production. 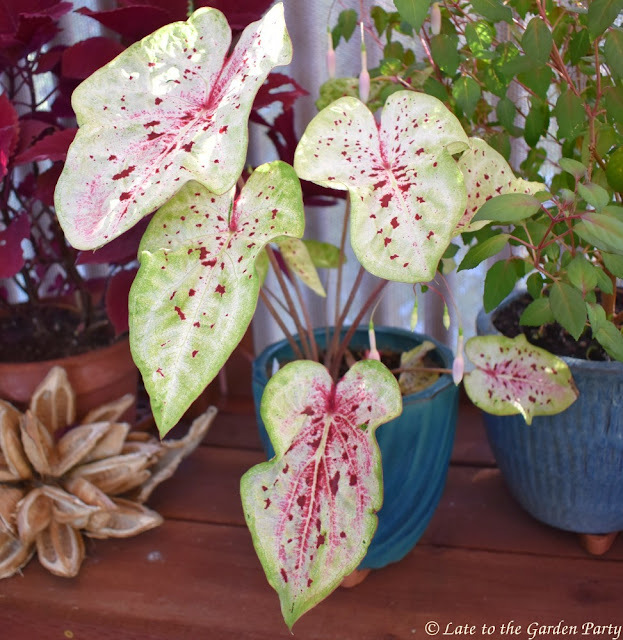 To see what kind of drama other gardeners have found in their gardens this week, visit our IAVOM host, Cathy at Rambling in the Garden. 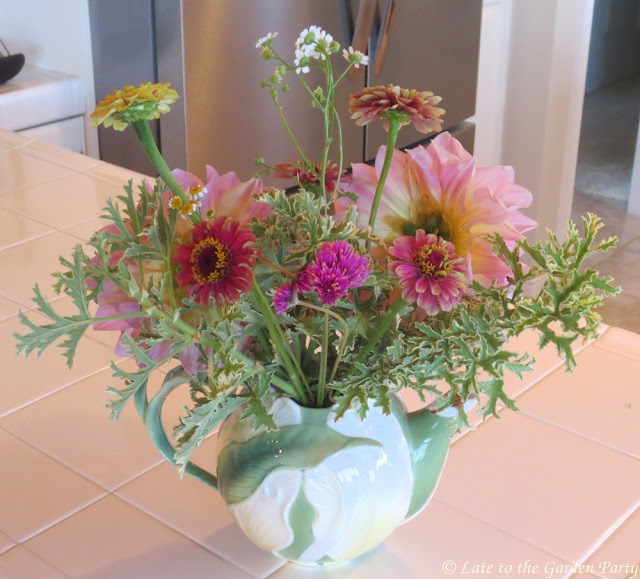 This week I felt the first subtle signs of the seasonal shift toward fall. The days are perceptibly shorter. Evening temperatures are cooler. The marine layer, although thin, was present more mornings than not. No plants have been newly incinerated by intense sun exposure. The neighborhood kids returned to school. 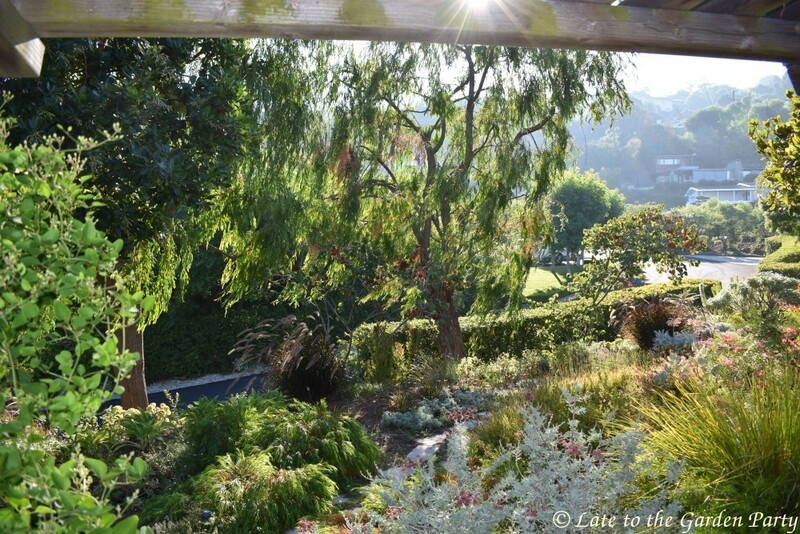 And the late afternoon light accentuates everything it touches. The northwest corner of the garden shines. With added water, the shrubs and perennials I planted there are filling out at last. 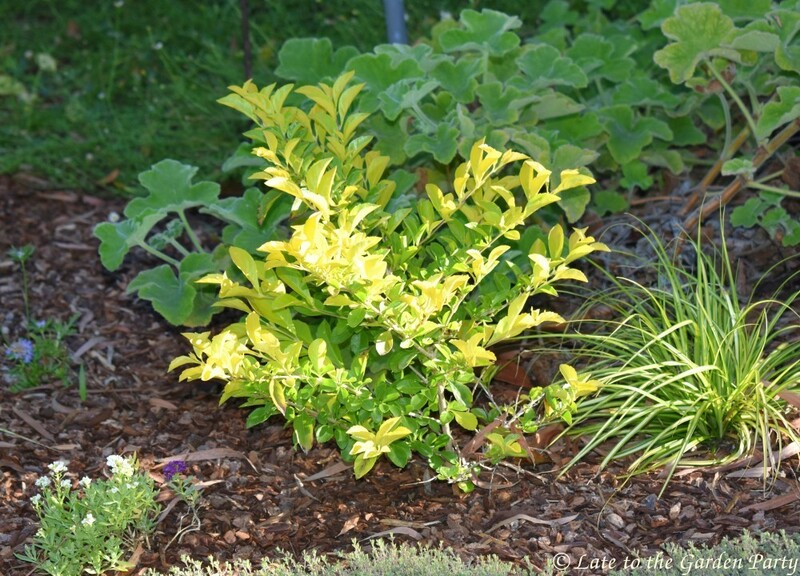 The sun picked up the color of Duranta repens 'Lime', also sold as 'Gold Mound'. 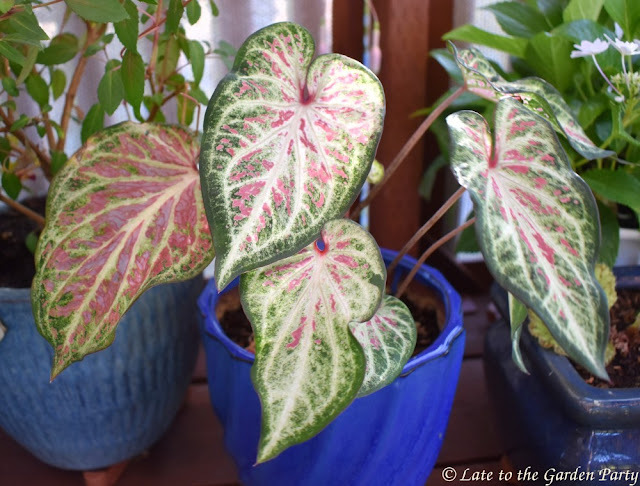 Although I have several of these plants, it makes me nervous as one of them shot up over 7 feet tall when they were marketed as growing 2-3 feet tall. This one's minding its manners (so far). The peppermint willows at the southwest end of our lot create a natural sun screen. This Agonis shows signs of sun scorch but still looks pretty. In contrast, the under-story Western redbud trees (Cercis occidentalis) were more badly damaged by July's heat blast but I expect they'll eventually recover. 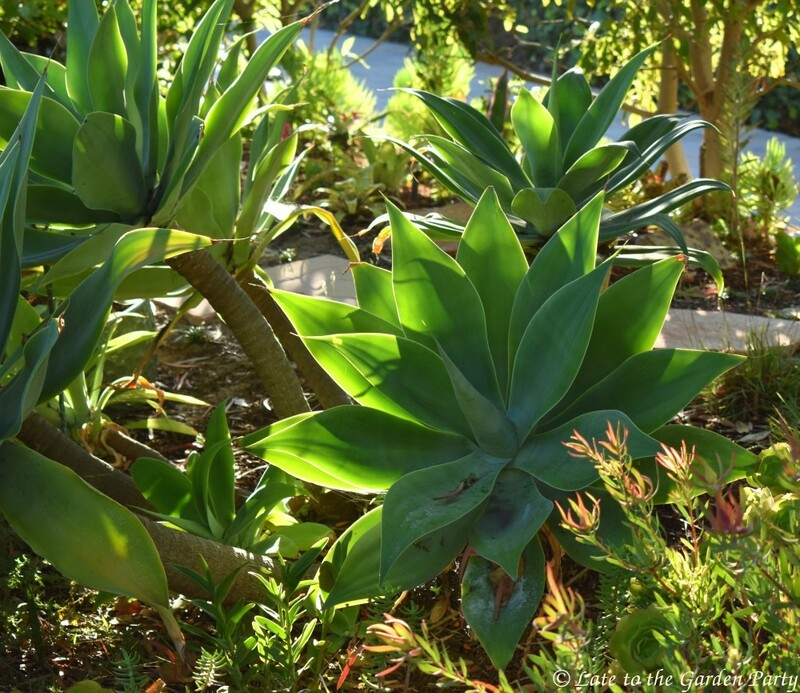 Variegated Agave mitis also shows itself off well in the sun. Planted from a small pot in February 2017, I was startled to see how much it's grown. In the lath house, the new sun screens my husband built seem to be doing the trick in protecting my burgeoning shade plant collection. Am I suffering from a delusion that summer is reaching its end? Almost certainly. Summer's high temperatures can easily extend into late October and even early November here. We toured our current house for the first time during a nasty heatwave in early October nearly 8 years ago - I had to beg my husband to get out of the car when we arrived. It's reasonable to expect we'll get another blast of heat or two before summer bids its seasonal farewell. I don't plan to cut back the foliage burned in July for another month or so yet, much less start replanting the areas left bare by summer's brutality, but I'm enjoying the first signs of fall in the meantime. Fall's arrival means winter is coming and the prospect of our first real rain since March 22nd grows closer. Whether you're continuing to celebrate mid-summer or joining me in anticipating fall's cooler days, best wishes for a pleasant weekend! 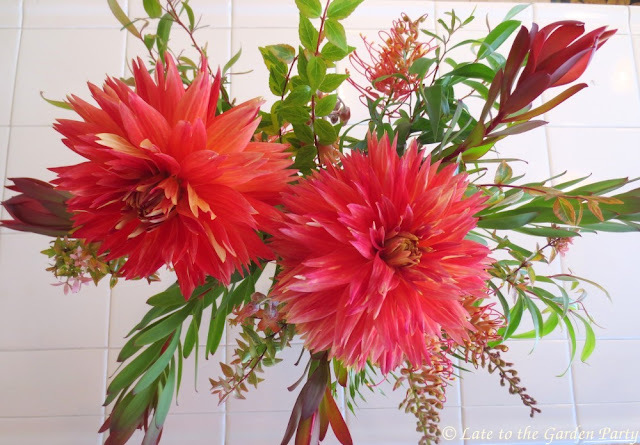 I'm joining Chloris at The Blooming Garden in featuring my top 10 blooms this August. August isn't a month I usually associate with flowers but, as mentioned in my earlier Garden Bloggers' Bloom Day post, judicious applications of extra water this year have had a major input on the floral output. We haven't received our August water bill so I'm not yet feeling as terribly guilty as I'm afraid I may feel soon. 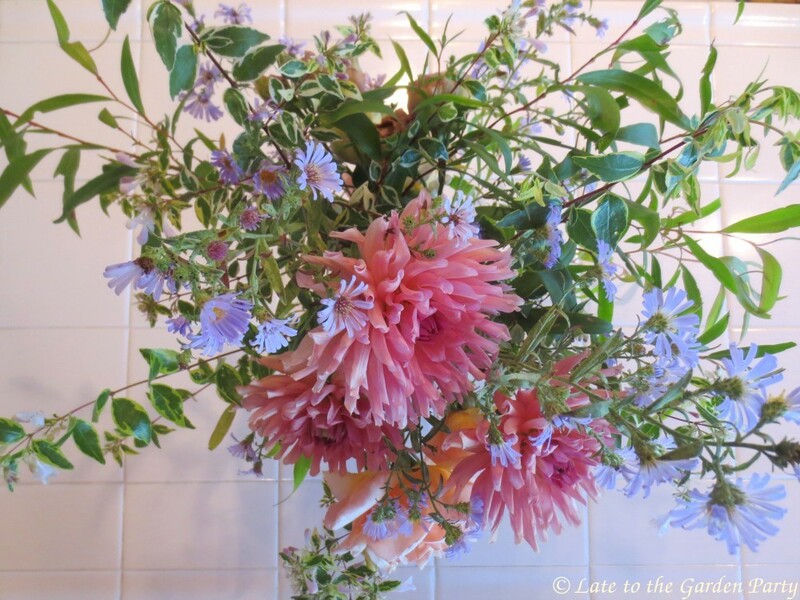 Winnowing down the flowers in my garden to 10 selections wasn't easy. 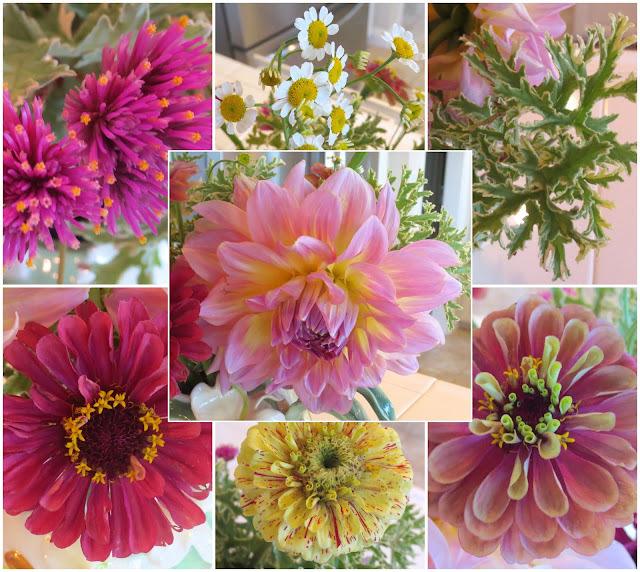 The sheer volume of bloom was a major factor in my choices. 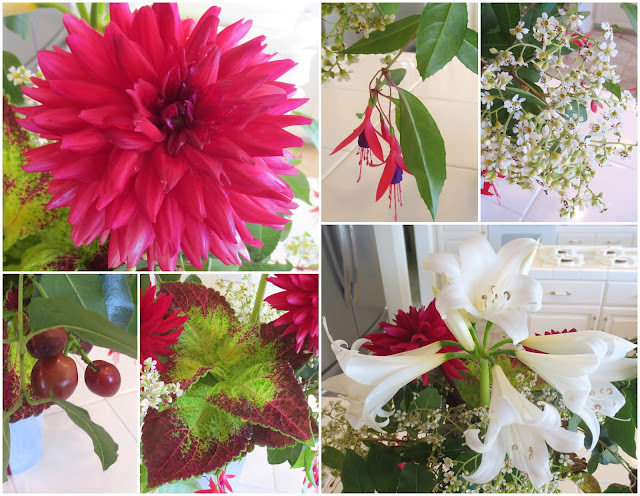 The current condition of the flowers was another, as was their photogenic qualities, but ultimately it's an emotional decision. Rosa 'Medallion' was an easy choice because it surprised me by making its first appearance of the year by blooming en masse. Roses here usually bloom best in spring before our temperatures soar, if they bloom at all. I had very few rose blooms last year and even fewer this spring after the lowest winter rain levels I've ever measured. 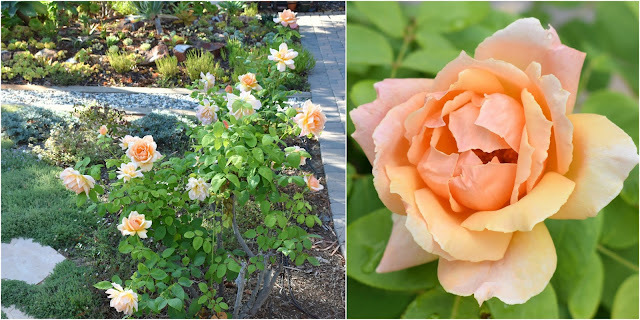 I inherited 2 'Medallion' rose shrubs with the garden. Of the paltry number of rose bushes I have, these had once been the most reliable spring bloomers but they didn't bloom at all this spring and they lost all of their foliage to a combination of rust and the nuclear heat that hit in early July. They leafed out again after repeated deep watering sessions but I hadn't really expected them to bloom in mid-summer even after I saw a few buds forming. Then I came home from a trip last weekend to find this! This may not be a lot of roses for some of you but it's a mass of bloom in my garden. Heteromeles arbutifolia was another surprise. 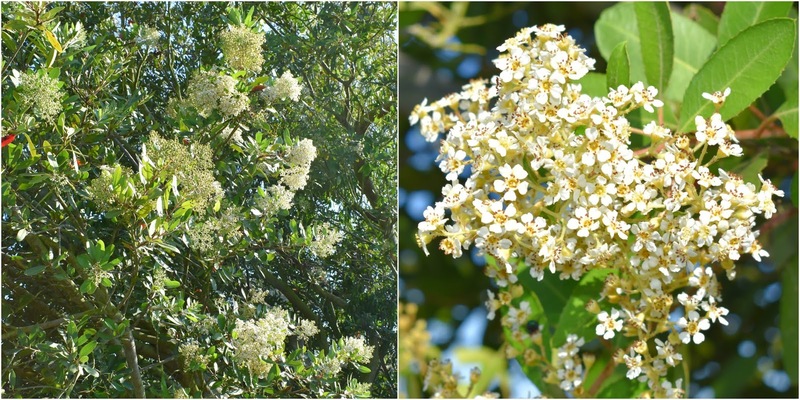 If this tree-sized shrub was blooming a week ago, I hadn't noticed it but now the blooms can't be missed. The common name for this plant is Toyon. 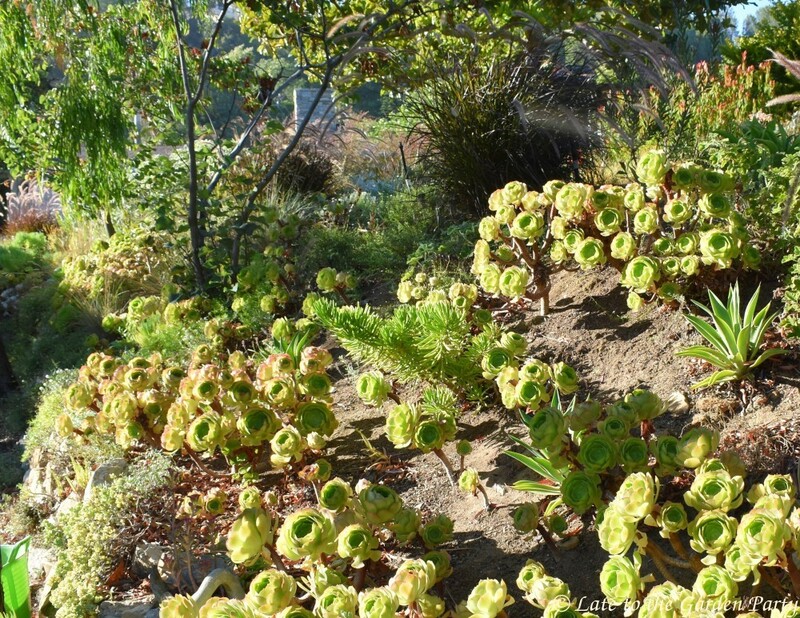 It's been selected as the official native plant for the city of Los Angeles. This one balances atop a steep slope on our property's boundary line and I estimate it's 15 feet tall. The flowers will be followed by a plentiful supply of red berries. The berries, although toxic for humans, are consumed by mockingbirds, robins, and cedar waxwings, as well as coyotes. 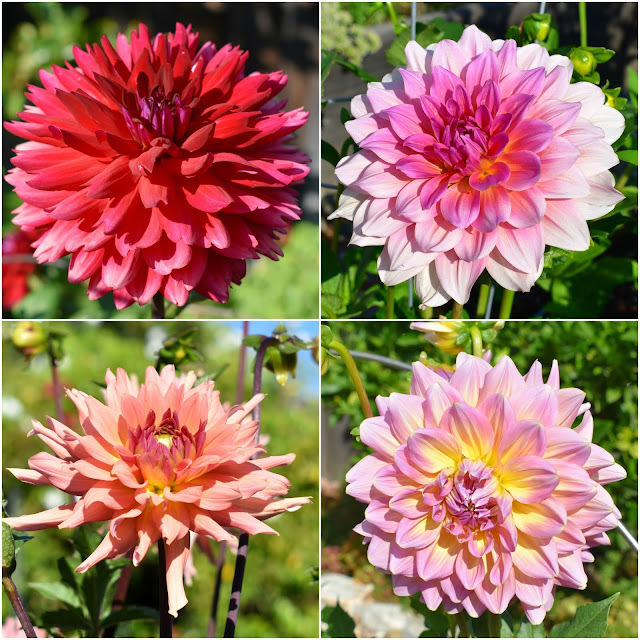 My dahlias were another obvious choice as a favorite but which one can be said to rule my cutting garden is another question altogether. Each and every one deserves recognition. Could you pick just one? 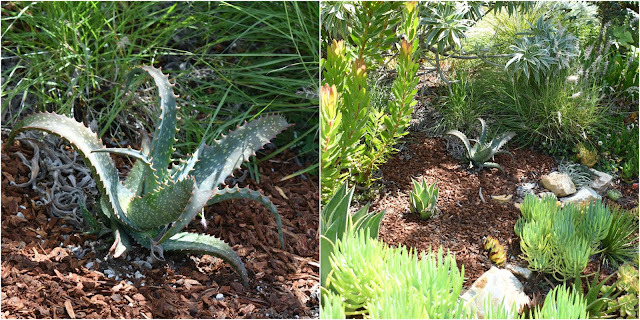 'Loverboy' (upper left) is flashy semi-cactus variety. 'Otto's Thrill' (upper right), a dinnerplate variety, has been the most prolific bloomer thus far, although it's quickly being overtaken by the smaller, semi-cactus 'Terracotta' (lower left). Dinnerplate 'Strawberry Ice' (lower right) is new on the scene. But it's 'Punkin Spice' that keeps drawing my eye. I don't remember that it impressed me as much last year but this year every bloom is a glowing orb. It's classified as an informal decorative type but the flowers are as large (or larger) than any in the dinnerplate class. The zinnias in the cutting garden also came on with a bang this month but there is one, grown from seed rather than plugs from the local garden center, that impresses me every time I see it. 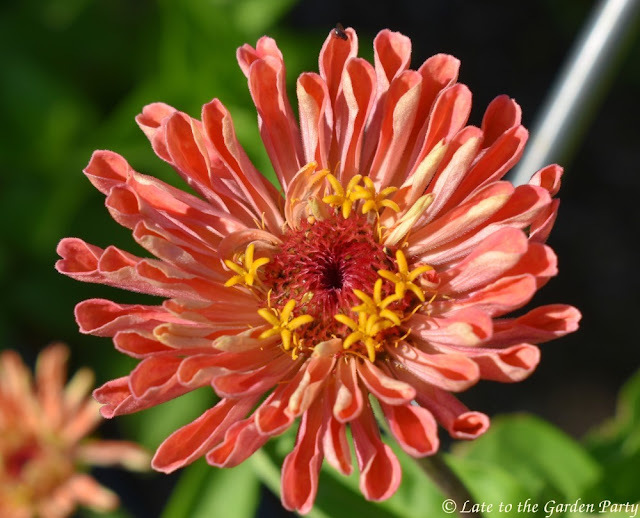 This is Zinnia elegans 'Benary's Giant Giant Salmon Rose'. Each bloom is perfect. 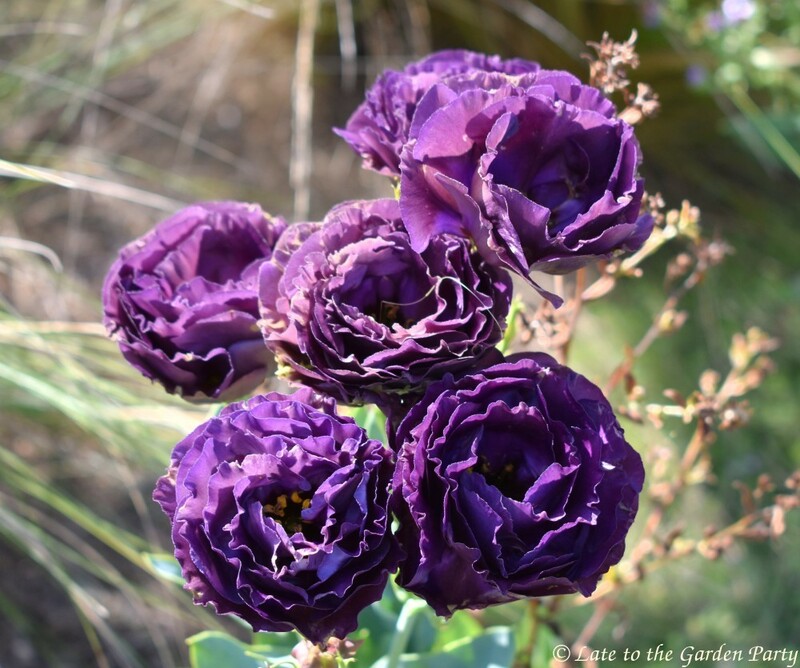 Have I forgotten my Lisianthus (Eustoma grandiflorum) you might ask? 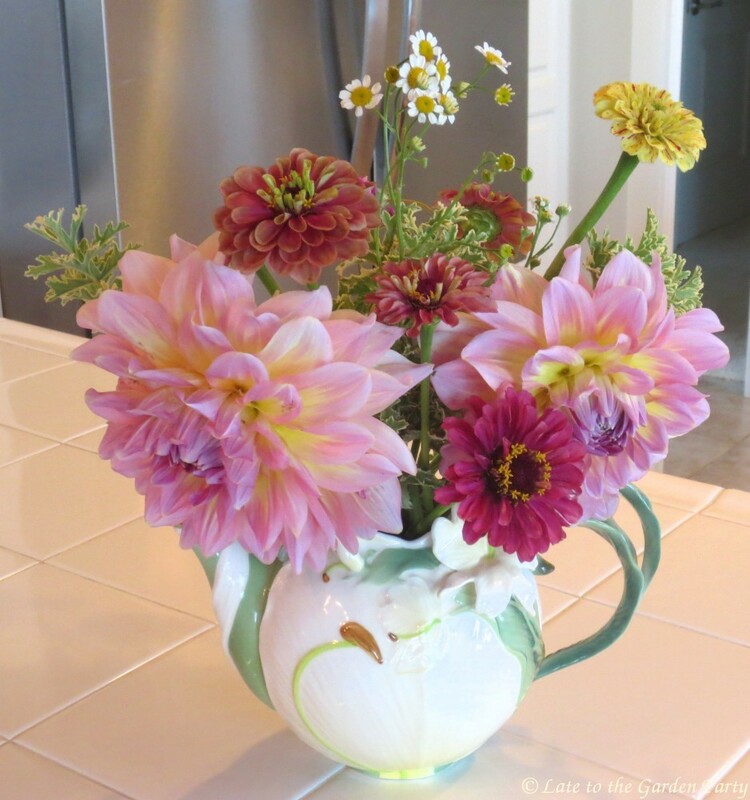 Of course not but, like choosing a favorite dahlia, the Eustomas that draw my eye shift from one week to another. 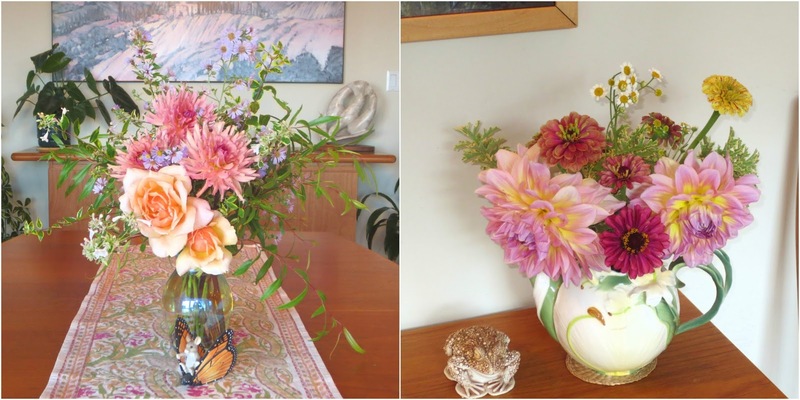 A week ago, it was the delicate green-flowered variety (left) that won my heart. A new variety, 'Mint Cocoa' (right) has been a favorite with commentators and I admit I'm impressed by how well it's performed this year. 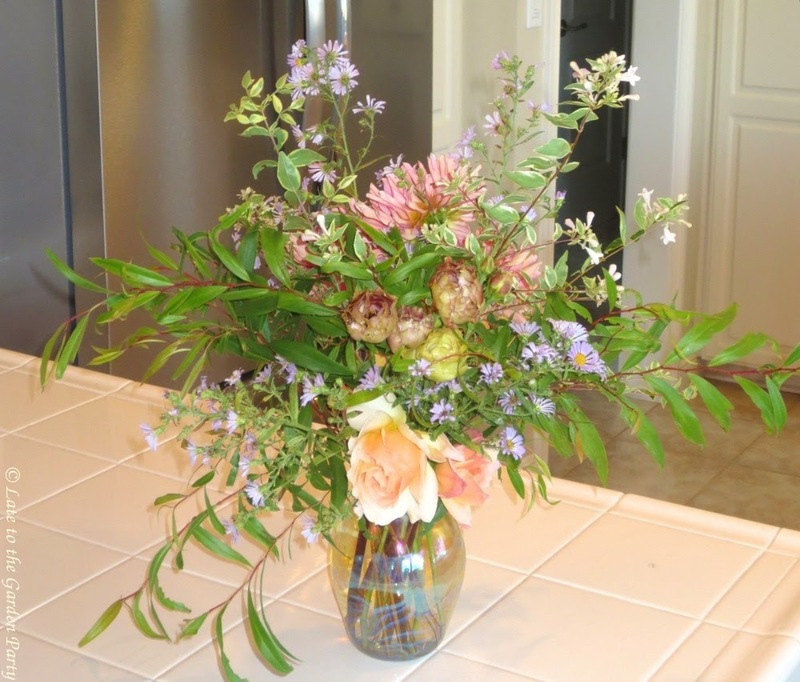 My biggest issue with it is that its unusual color doesn't mix well with most of the flowers surrounding it. I'll need to find a better placement for it next year. Eustoma grandiflorum 'Black Pearl' wins my thumb's up for late August. It's blooming on last year's plants. 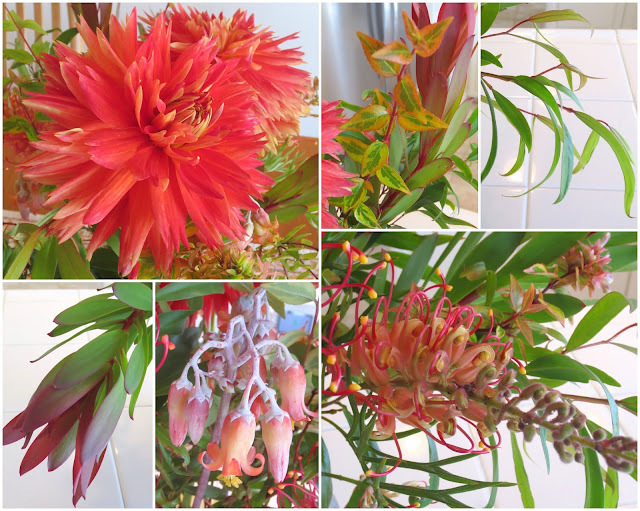 Last year I found its performance disappointing but it's a happier plant in its second year. The flowers are tighter and more heavily petaled than most of the other varieties of Eustoma growing in my garden. Its shape and growth habit closely resemble that of 'Mint Cocoa'. 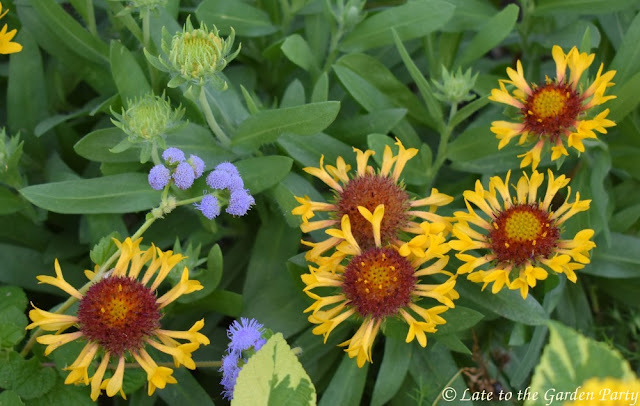 A number of more common flowering plants make up the rest of my mid-summer bloom list. This is the native California aster, Symphyotrichum chilense. I put in 2 plants in 2015 but, if you looked at the bed it's growing in, you might think there were a half dozen or more plants there. It spreads by rhizomes and is a little more exuberant than I'd expected but it's the only aster I've ever considered a success here. Plumbago is VERY common here. From my home office window, I can see a large mass of it in bloom across the canyon. It's blooming up the street and I see masses of the blue flowers along the road every time I leave my neighborhood. 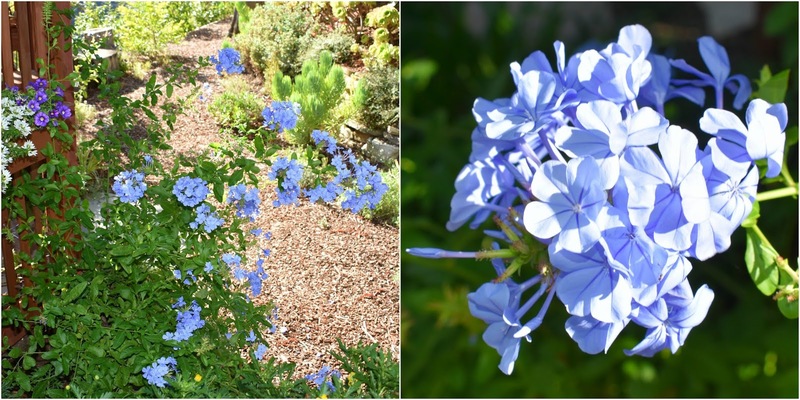 My plants, Plumbago auriculata 'Imperial Blue', are better behaved in large pots outside my lath (shade) house. Lantana 'Samantha' is having a banner year. 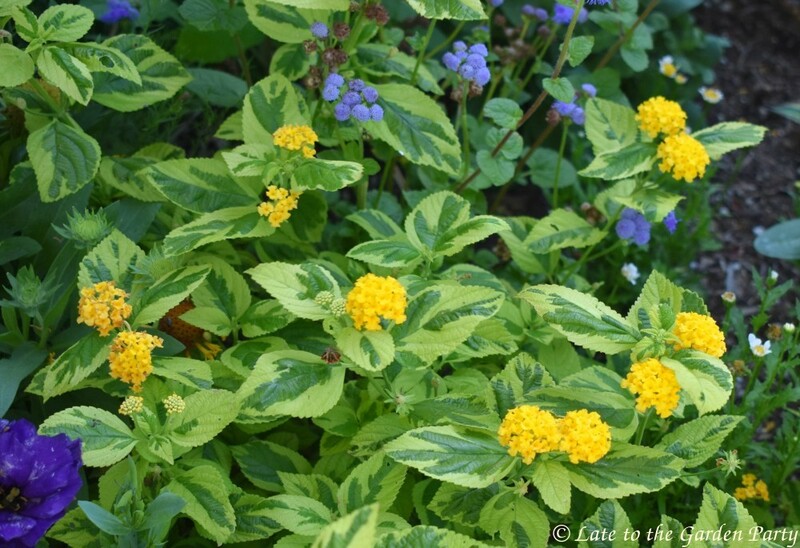 I love the cheerful yellow flowers but the variegated foliage is its main attraction. It makes me think of Ceanothus 'Diamond Heights', a plant I've killed at least 3 times, but in contrast this Lantana is easy to grow and happy here. Gaillardia 'Fanfare Citronella' in the same bed as the Lantana is another current favorite. 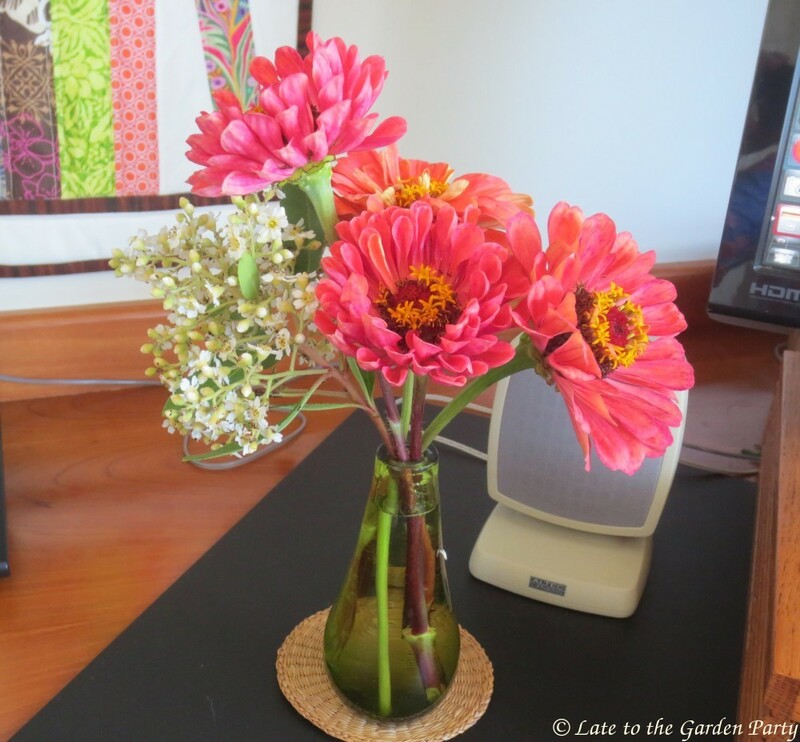 While the flower stems are annoyingly short, the flowers are prolific and of course loved by bees. I've got as many as a half dozen varieties of Abelia in my garden, all of which I love, but at the moment this older variety, Abelia grandiflora 'Edward Goucher' is what's grabbing my attention. The 2 large shrubs came with the garden and, unlike the varieties I've introduced, there's no variegation in the foliage of these but they do pump out the blooms! I cut the 2 shrubs back hard in late winter and I've been rewarded this year with lots of long flowering stems. When the flowers drop, they leave behind reddish bracts just as pretty as the flowers themselves. Could you distill the bloomers in your garden down to just 10 plants? 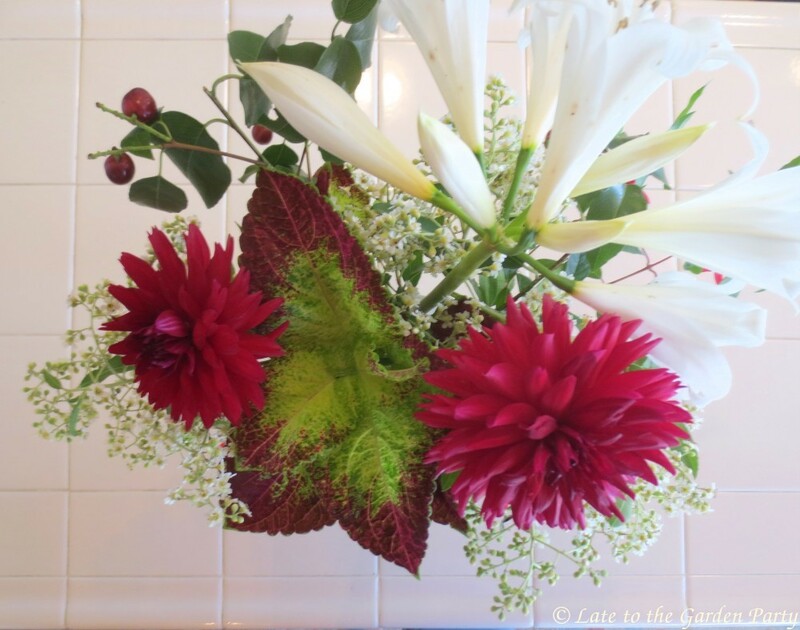 Visit Chloris to find her list. My husband and I were gone for 3 days to attend a family wedding in Northern California. It was a beautiful ceremony and the reception was a joyous celebration but, as we drove to and from the event and returned late Sunday afternoon, the trip felt harried. 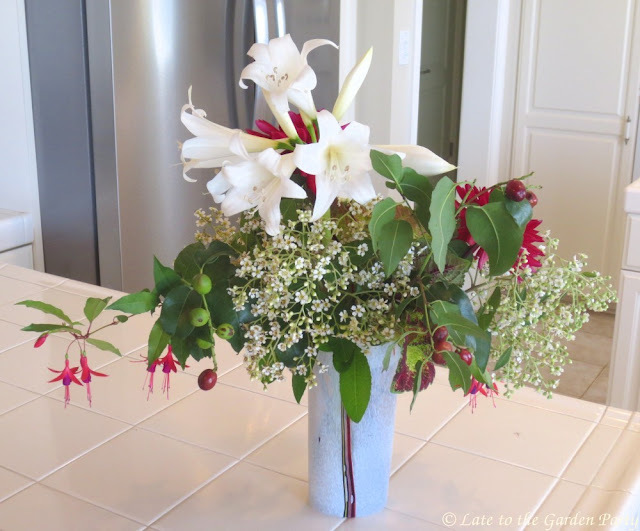 There was little time to put one vase together, much less two, for "In a Vase on Monday." 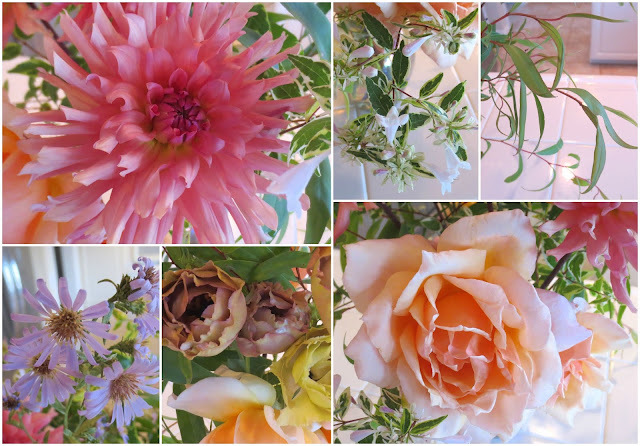 That didn't stop me but the quality of the arrangements - and my photographs, all taken in the early evening - suffered. Roses (!!!) bloomed en masse on a few shrubs during my absence. My 'Medallion' roses hadn't bloomed at all this year - and they chose to do so while I was gone. I could joke that I need to go away more often but the blooms are actually a response to the deep watering I've been giving them at intervals over the course of the last several weeks. I've been seriously contemplating pulling them all out and this was my last ditch effort to see if they could earn their space in the garden. 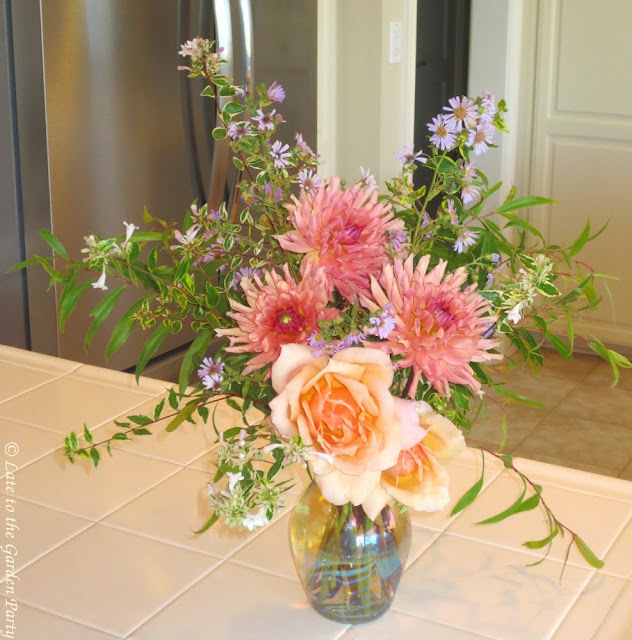 The California asters (Symphyotrichum chilense) were a last minute addition. 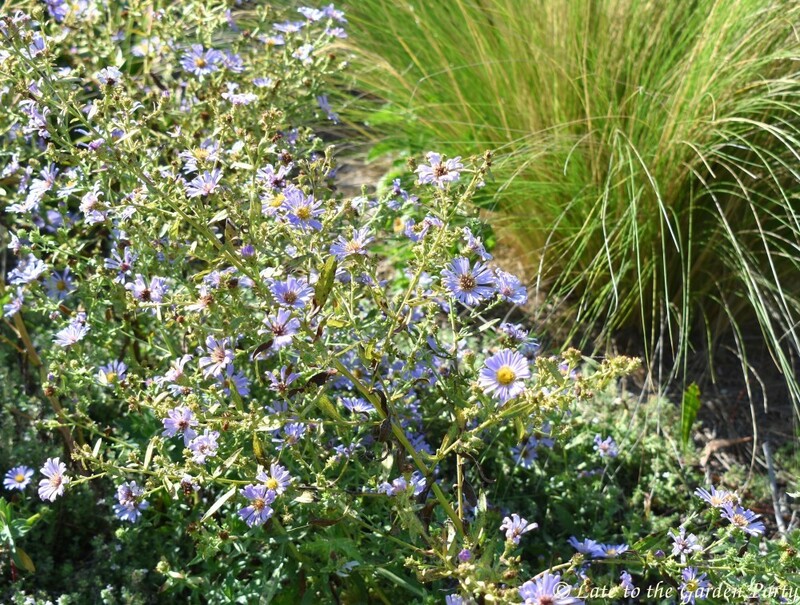 Those flowers are spilling all over one of my backyard beds at the moment - and they haven't received any extra water! 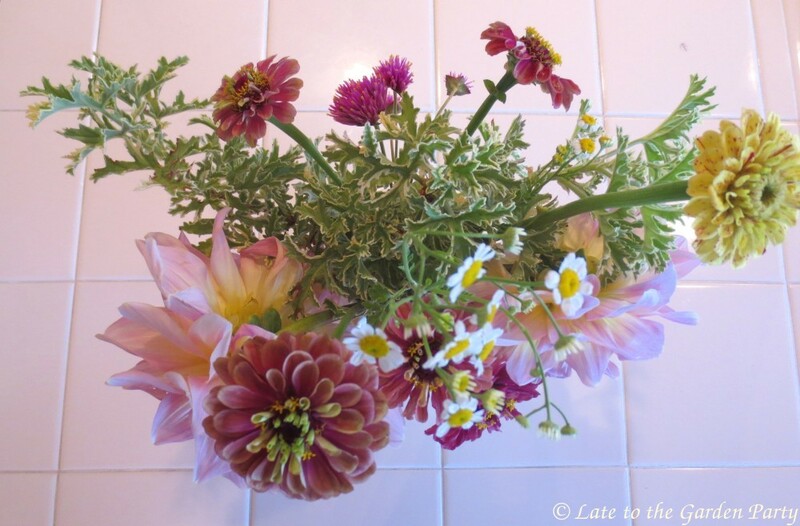 The dahlias in my cutting garden also bloomed like crazy in my absence. Most of the 'Otto's Thrill' variety were already past their prime but I was able to cut two of the first blooms of 'Strawberry Ice', one of the new varieties I purchased this year. I filled in with zinnias mainly because they were right in front of me when I was cutting the dahlias. Discovery of the Gomphrena 'Fireworks' was a surprise as the plants are hold-overs from last year. This post was hastily put together as well but I couldn't miss an opportunity to join my favorite meme. 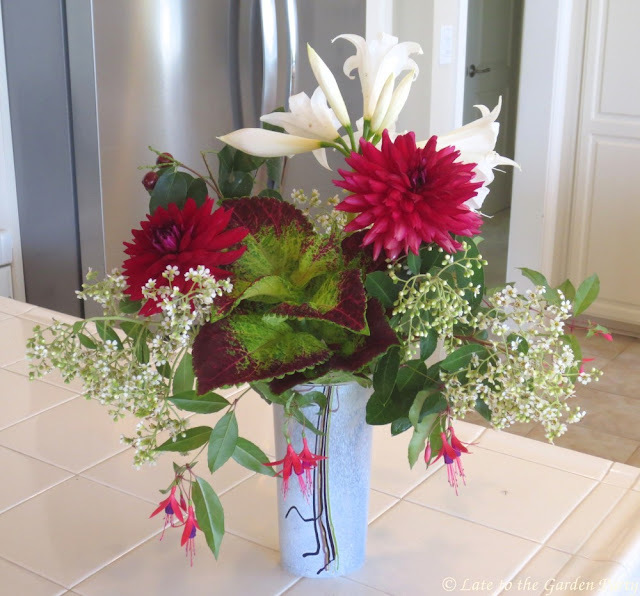 For more "In a Vase on Monday" posts, visit Cathy at Rambling in the Garden.